They say the way to someone’s heart is through the stomach. We suggest taking your sweetheart to one of these delicious Valentine’s Day dinners with a twist. The Love is Old, Love is New offer will sail you and your beloved around the Al Seef development (a la Jack and Rose sans the villainous iceberg) as you sup on a five-course dinner to the tune of live entertainment. The cruise includes a romantic photo opportunity too. From February 14-16; Dh1,390 per couple. Call 04 336 6768. Trust Japan to do Valentine’s Day better than the rest of us and double the return on romance — the Far East country’s Valentine’s Day tradition ensures only men receive gifts on February 14 and a month later on March 14 or White Day women receive the reciprocal gift. In keeping with that tradition, Japanese restaurant UMI has prepared a set menu for Valentine’s Day accompanied by a small gift for gentlemen as well as a 25 per cent discount for couples who book ahead for White Night. From Dh330 per person; call 07 203 5555. Dine al fresco with views of the Dubai Water Canal at the restaurant’s terrace. 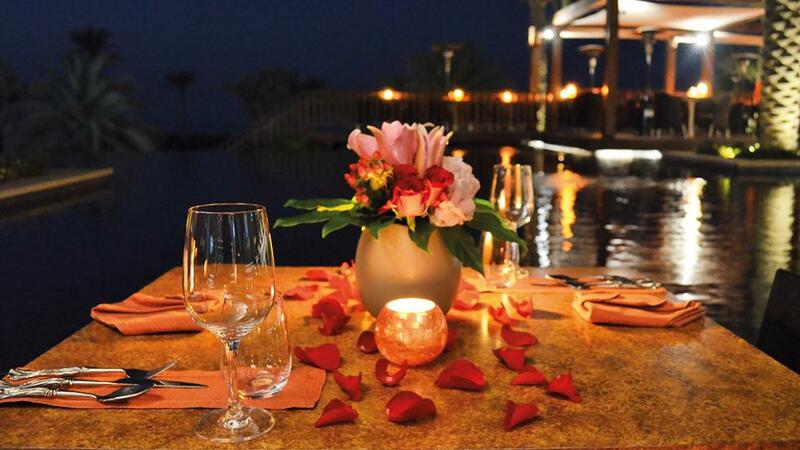 Couples can enjoy a set dinner menu for Dh160 per person but it gets better after Valentine’s Day – bring an actual edible date to your date night on February 14 and the restaurant will serve couples a special mocktail in exchange. Call 04 512 5511. So what if your love at first sight didn’t come with violins playing in the background? St. Regis’ Dine Under the Stars’ offer will see you and your beloved serenaded by a live violinist and saxophonist as you enjoy a four-course candle-lit dinner in a cabana by the pool. Dh1,200 per couple, from 8pm. Call 02 498 8888.